These modern loveseats reflect refreshing look with simple and elegant designs that are worth noticeable. Unprecedented in comfort and quality, this durable and long lasting modern loveseat collection is perfect for small dorm rooms to apartments and large living room. This collection offers you the best of the best to select from a wide array of colors and a variety of upholsteries. Enhance the décor of your room with the customizable mod design of the attractive Colbie Modular Loveseat with an accompanying ottoman. Enveloped in ultra-soft gray velvet upholstery, both sofa and ottoman can be used as a bed. Just fold out the convertible sofa and stack in the ottoman to get a cozy queen size bed for your overnight guests. You can also slide in the single ottoman and transform this loveseat into a built-in workstation or a side table while being seated on it. Versatile and very practical, this multipurpose loveseat is a must-have in every home. A quality product crafted in Atlanta, GA. This loveseat includes a matching ottoman. Fold out loveseat and stack the ottoman inside to convert them into a queen size bed. Upholstered in gorgeous and soft gray velvet. Also comes in other lovely colors including black, blue brown, sand, mocha, tomato and turquoise. 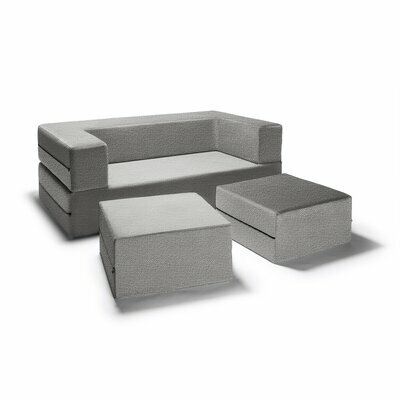 Sofa and ottomans are cushioned with highly durable foam. Removable covers have stylish black zipper. It does not require assembly. Merging trendy style and elegance, this luxurious loveseat features a high profile look. 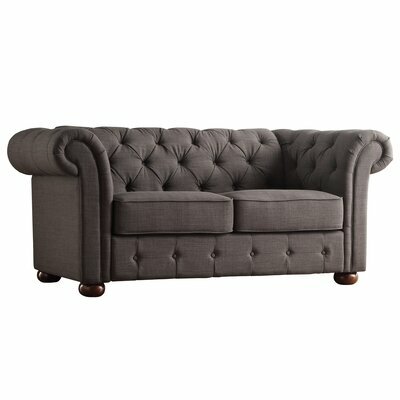 The mesmerizing Augustine Tufted Loveseat showcases deep button tufts, pleated rolled arms and bun feet. It promises comfort with durability for many years to come. Rubberwood frame provides long lasting durability. Deep button tufts accent the back, arms and lower front panel. Covered in dark grey linen upholstery. It is available in more fabric colors including purple, red, brown and grey. Spacious seat has seating capacity for two people. Thick and plush seat cushions ensures comfortable seating. Removable seat cushions allow easy cleaning. Requires assembly, all tools needed for assembly are included. Comes with 1 year limited product warranty. Plush and ultra-soft microfiber velvet gives this gorgeous loveseat a comfy and elegant touch. The cozy Meniru Reclining Loveseat features dual reclining seats that offer unprecedented comfort. Plop on this reclining loveseat and forget how tiresome your whole day was. Grab a book or a cup of steaming coffee and enjoy a relaxing evening on this loveseat. It has seating capacity for 2 people. Walnut colored microfiber upholstery is soft and durable. This lovely loveseat also comes in charismatic caramel color. Wide and plush pillow-top arms. Maximum weight limit is 500 pounds. Ready to install; this loveseat does not require any assembly. Create a mesmerizing focal point in your living room with the chic and stylish look of this retro-modern loveseat. Deep tufts with fashionably elegant slanting legs and flared arms accentuate the overall look of this aesthetically appealing loveseat. You will love sitting in comfort and poise on this cozy loveseat. Standard design with modern styling. Wrapped in ultra-soft chenille fabric. Bold and beautiful black color. Embellished with deep tufts for a chic look. Also available in gorgeous grey color. Slanting legs in elegant espresso finish. This loveseat requires assembly and is quite easy to put together. Ideal for residential application, can also be utilized for commercial purpose. Luxurious and elegant Mulhouse Furniture Garcia Loveseat will be a valuable addition to your modern styled loving room. This charming beauty is artistically accentuated with deep button tufts, pleated rolled arms and espresso finished bun feet. The cushions are filled with plush and thick, high density foam to ensure you get relaxing comfort when you sit on it. Loveseat is crafted from kiln-dried hardwood. Has seating capacity for 2 people. Covered in durable linen upholstery. Stain resistant fabric with performance finish. Handcrafted deep button tufts on back, arms and lower front panel of the loveseat. Filled with CA117 fire retardant, 52 pounds density polyurethane foam. Welt on seat cushions retain crisp shape. Loveseat rests on solid wood bun feet in espresso finish. Detachable feet, comes with leg glides. It is very easy and simple to put together. Maximum weight capacity of this loveseat is 600 pounds. Perfect for both residential and commercial application. ISTA 3A certified for damage-free transit. The unique and versatile Zipcode Design Modular Loveseat is a perfect choice for a modern living room. This sectional loveseat is detachable. It comprises of one left facing chair and one right facing chair that can be attached or detached as per your requirement. The Modular Loveseat by Zipcode Design features sturdy hardwood frame tufted back cushion, square arms and chrome legs that add value to its overall look. Elegantly upholstered in black faux leather, this loveseat will become a center of attention in your living room. You can also add an optional deluxe arm chair or slipper chair to extend the loveseat. It is a sectional loveseat. Includes two chairs; one right facing and the other left facing chairs. Chairs can be attached with the help of a bracket. Durable and high performance upholstery. Upholstered in bold and beautiful black faux leather. Also comes in attractive espresso color. Supported by chrome finished steel base and legs. 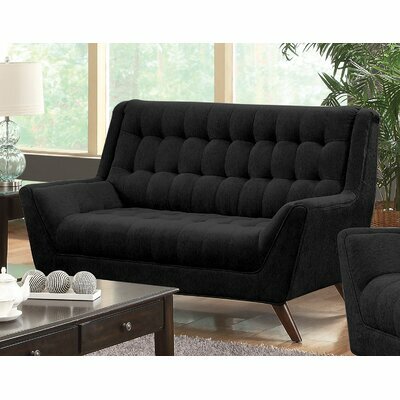 Make a chic and stylish seating spot in your living room with the trendy Vernon Loveseat. This mod and trendsetting loveseat will blend elegantly in your modern home décor. The bold and beautiful bonded leather upholstery creates a hard-to-miss view with the glimmering chrome finished metal legs. You will enjoy relaxing on this cozy loveseat with wide arms and adjustable headrests after a long day’s work. Has seating capacity for two people. Wide and spacious seat cushions. 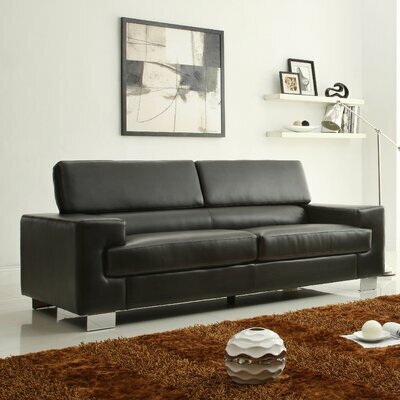 Chic and stylish black faux leather upholstery. Also comes in white color. Chrome finished metal legs support the loveseat. Ready to install, does not require any assembly. Maximum weight limit of this loveseat is 275 pounds. 90 days limited product warranty provided by the manufacturer. Bedeck your living room with the Carnegie Modern Loveseat showcasing a dazzling and radiant look with button tufts and glimmering silver nailhead detailing. The durable beige linen upholstery blends effortlessly with a wide range of room decors and color themes. Its unique and maverick silhouette looks absolutely stunning with the conical shaped slanting black legs. Durable and sturdy construction using MDF wood for frame. Accentuated with deep button tufts and silver nailhead detailing. Wrapped in beige linen upholstery. Filled with fire retardant polyurethane foam. Slanting black birch wood legs with no-marking feet. It requires assembly; no additional parts required. Manufacturer provides 30 days limited warranty on parts only. The bold style with unique design and gorgeous dual-colored upholstery of Tina Loveseat is awe-inspiring and worth noticeable. 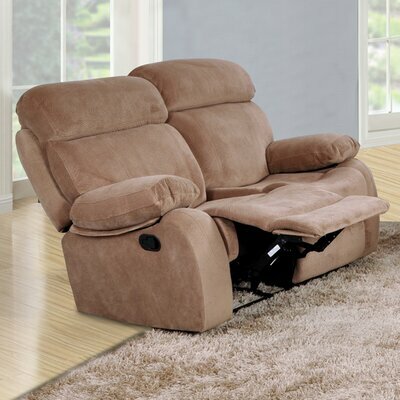 It features cozy seat cushion with wide and plush arms that promise you ultimate comfort and relaxing experience. The orange and black faux leather upholstery with silver toned legs creates an absolutely stunning look that is hard-to-miss. Frame is built from sturdy solid wood. 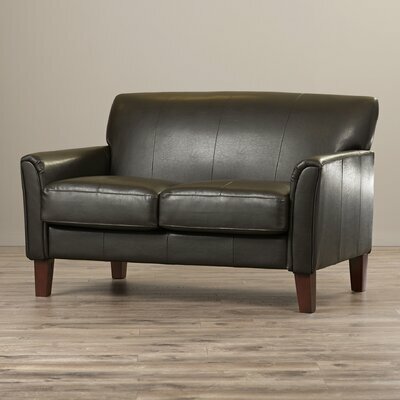 Durable and easy-to-clean bonded leather upholstery. Color of the loveseat: Orange/ Black. Available in multiple fabric color combinations including Red / Black and White / Black. Stylish and unique chrome plated legs. With modern take on classical mission style design, the attractive Clintonville Loveseat is a must have is every home. 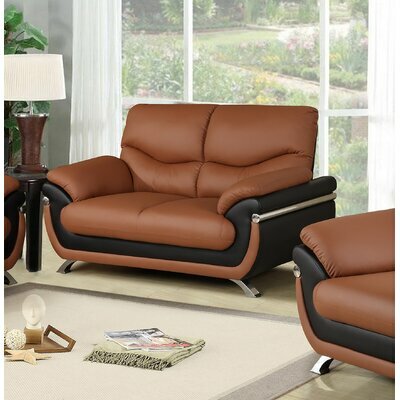 It features innerspring seating system and plush dark brown microfiber upholstery for more comforting and relaxing experience. This loveseat is easy-to-clean. Just use a damp cloth to clean it so that it retains its elegant look. Frame is crafted from solid wood for optimum durability. Soft and durable microfiber upholstery with solid print. Solid print fabric with dark brown color. Features stylish steam bent tuxedo arms. 4 inches high tapered legs in beautiful brown finish. Maximum weight capacity is 400 pounds. Very easy to assemble and comes with tools required for assembly. Comes with one year limited manufacturer’s warranty.